It wasn’t pretty to say the least, but with the way last Sunday ended, the Steelers will take a win anyway they can get it. The black and gold got a solid outing from their defense, pulling off a huge pick six that helped them get to 3-2 with a 17-9 win over the still winless Jacksonville Jaguars. The victory ties them with the Ravens for second in the AFC North, as Baltimore lost to the Colts in Indy. The win also sets up a big AFC North game next Sunday against the 2-2 Browns in Cleveland, as the Browns seemed destined to go to 1-3, but rallied down 28-3 to beat the Tennessee Titans on the road 29-28. Brice McCain pulled in the biggest Steelers defensive play of the year, taking a Blake Bortles pass and going 22 yards the other way, turning a 10-9 Steelers lead into a 17-9. McCain stepped in front of receiver Allen Hurns early in the fourth quarter, Bortles’ wobbly sideline pass and went untouched the other way. The play was needed, as an offense that looked on paper like it could dominate, was average at best. They put up a touchdown and field goal against a Jags defense that was terrible entering the contest. Ben Roethlisberger completed 26 of 36 passes for 273 yards, with a touchdown. The only Steelers offensive TD came when he threw a 1-yard scoring pass to tight end Michael Palmer late in the second quarter. It looked as if the offense was going to get the team to 17-9, but Roethlisberger fumbled deep in Jags territory, but the team was bailed out when McCain pulled in the pick six. Le’Veon Bell had 82 yards rushing on 15 carries, and Antonio Brown finished with five receptions for 84 yards. Heath Miller added three catches for 46 yards a week after hauling in a career-high 10 passes. It was a day for the defense though, as they held the Jags to a total of 246 yards, a number they are going to have to get near duplicating if they want to beat Cleveland next Sunday. Bortles was 22 of 36 passes for 191 yards in defeat for the Jags, who are 0-5. 6 Comments on "Defense Steps Up When Needed; Steelers Beat Jagaurs 17-9"
Matt Loede and Robert Smith both emphasize the play of the defense in today’s win, because, in reality, there is very little else worth a headline. Haley’s play calling, Ben’s fumble and inaccurate passing, and the over all lack of production made this offense look as inept today as it was against the Bucs last week. This headline could as easily have read: “Mediocre Steelers Top Game But Winless Jags.” What more is there to say? Yes, let’s give the defense credit for today’s victory, but let’s also accept that this defense cannot carry the Steelers offense against a quality team. LeBeau simply doesn’t have enough talent to hold most NFL teams to 9 points or less. The Steelers next face, in order, the Browns (who rallied 26 points to win today), Texans, Colts, and Ravens. If our offense continues to play as it has the past two weeks and scores only 17 points per game or less, we will be lucky to win even one of those four games. That’s not a prediction — just an objective assessment of a team that is struggling to remain mediocre. Hey DrGeorge, as always thx for your comments and support of the site! 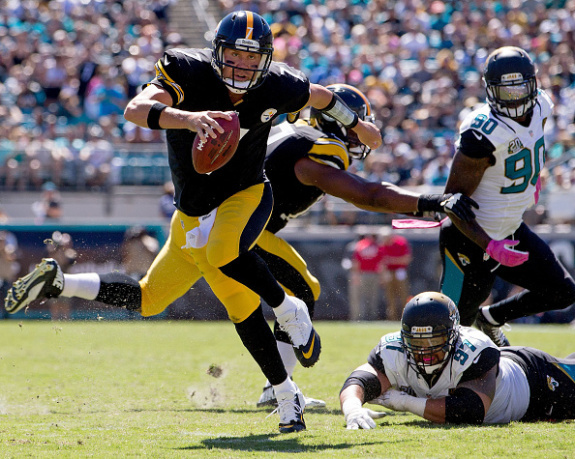 Personally I am not worried about the offense, I think today was a sign of a Jags team playing a lot more inspired than they have at any point of the season, and it seemed like the Steelers offense was a bit off most of the day, but hey, they made the plays when they needed to. As far as the D goes – loved the intensity down the stretch, and to think that two huge plays came in the last half of the fourth quarter (the pick 6 and the third down Keisel knock down), I think looking at it from that angle you will see why I think this was a win to at least feel good about today. Sure I would (like everyone else) have loved to have seen the Steelers win 42-0, but I look at it like this – they pulled out a big road win (2-1 on the road now) and I actually don’t mind that the Browns rallied, as they are a team that never seems to put two good games together, meaning they should be back to being the ‘same old Browns’ this upcoming week. I felt after Carolina the Steelers would be 6-1 after Houston, but hey, two more wins and I think they are set up nice for the two-home game stretch vs the Colts and Ravens sitting at 5-2. Sure I could be wrong and they could be 3-4, but I feel better after the win today, and I think they will have a MUCH better game plan for the Browns the second time around this Sunday. As bad as I hate to admit it , DrGeorge is probably right . If the Steelers offense continues to struggle I honestly dont see them beating the Browns next Sunday . As far as the Colts and Ravens , we have virtually no chance against either . Bottom line , the Steelers are far to inconsistent on both sides of the ball . This team needs to stop throwing the ball so much and use our running game. Bell had 15 rushes. Needs to be over 20 and 5 to 10 for blount. Seems we forgot how the Bus wore down defenses and we controlled time of possession. These bubble screens need to go. Agree with doc….putrid offensive performance…and, as much as I hate to admit it, BB is too inconsistent of a QB to win regularly with a mediocre at best defense. Our LT is undersized but most importantly, BB is seemingly always holding onto the ball too long! What are you looking at, Ben, it’s the Jags! The popcorn vendor could get open against them! Just throw the ball to the open receiver AND LEARN HOW TO READ A &$! ?# DEFENSE ALREADY!!!!! Matt, I hope you’re right. Like everyone else on this site, I love the Steelers and hang the team pennant off my porch on game day, win or lose. I try not to be negative in my comments without offering factual support, nor am I overly influenced by the final score. In fact, even if the Steelers were 5-0 right now instead of 3-2, I would still be concerned about the quality of play. Here’s why. Did you see what the Patriots did to the Bengals last night, or what the Colts did to the Ravens? We have already lost to the Ravens and don’t look capable of beating the Bengals at this moment in time. Yet the Patriots and Colts, as good as they are, both have two losses and are not playing as well as the top teams in the NFL. That is some measure of how far the Steelers and this division have fallen and how far the Steelers have to go to be a playoff contender again. The Steelers will improve their play, hopefully, and there are things they could do — like running the ball more and cutting down on untimely penalties — that might enable them to win the division. But this is an inefficient and inconsistent football team right now in nearly all phases of the game — a team that has struggled to compete against two winless teams the past two weeks; a team that is 3-2 only because its wins have come against opponents that are at the bottom of their divisions. Those facts can’t be wished away. Given the injuries and lack of talent on defense, it appears that LeBeau has this D. playing as well as it can. That means the more talented offense must carry this team, and 17 points a game won’t get it done against teams (the vast majority) that are better than the Jags.